Prepare yourself to see new hardware… use your instinct and relate them to the lspci and lsusb outputs. Note down the pciids and usbids. Go on the internet and look for the right drivers. Load the (experimental) drivers and watch dmesg as your kernel happily integrates the new drivers or pukes it out. Attansic L2 Ethernet driver is present on some systems by default (eg. Ubuntu Gutsy) but not in others like Debian GNU/Linux. Ubuntu has a binary driver and I can't locate the source for. I used an unofficial experimental driver that didn't compile. Commented out some code to make it compile. The link to the driver provided in this article is the final result of the modifications. These dumps are useful in determining what kind of hardware you have. Remember to update pci ids and usb ids to the latest possible. This process is distribution specific. For example, in Debian GNU/Linux, use update-pciids and update-usbids. Bus 006 Device 002: ID 0bda:0116 Realtek Semiconductor Corp.
First roadblock: The Attansic L2 Ethernet adapter: without a driver for this, you can't even browse the internet looking for one. I'm going to give you a headstart by spoonfeeding you: Here's the archive: atl-l2.tar.bz2. Just extract it make && make install. The driver should work out of the box. Next, get audio working. No issues with this one- should work right away. Video: just get the nonfree ATI driver and it should work quite easily too. Forget about the wireless card for now- I haven't managed to get it working yet and it's better to wait a bit and save yourself some pain. and replace the provided Makefile with this file. Then make && make install. You should be video chatting in no time at all. 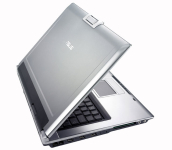 I'm the happy owner of an Asus F5RL and would first like to thank you for your linux-laptop entry, which was useful to me. Perhaps you'd like to know that I have the Wifi working on mine (and also, to some extent, the hotkeys). I'm using a stable Debian (etch) distribution, with kernel version 2.6.18-5-686, and downloaded the madwifi snapshot madwifi-ng-r2756+ar5007, as instructed in madwifi ticket #1679. I don't know what prevents your Wifi from working; maybe the ACPI is interfering somehow. Concerning the hotkeys, I noticed that with asus_acpi loaded, acpi produces events for hotkeys, with the exclusion of the « Media player », LCD brightness control, and « Camera » keys. The association is as follows. This allows you to use those with acpid, either via a premade package (acpi-support worked partly), or with a custom script, which I did. This settles the volume keys, power button, and sleep key; the start/stop-Wifi and start/stop-LCD keys work natively. (Which is a pity, by the way, as this Wifi key interferes with the Wifi switch on the side). I did not manage to make the LCD brightness control work, bud did not try too hard.